What is the smallest substrate size I can use? What substrates may I use with the In-Situ 4000 Process Monitor? Can I use the In-Situ 4000 Process Monitor on transparent substrates? What is the index of refraction of my film? What is the reflectance of my substrate? How should I calibrate the reflectometer to my chamber? Should I use one-color or two-color pyrometry? What is the difference between one-color and two-color pyrometry? Will the In-Situ 4000 Process Monitor work with a heated viewport? How accurate is the deposition rate measurement? Can I use the In-Situ 4000 Process Monitor during substrate rotation? Will the In-Situ 4000 Process Monitor automatically control the substrate temperature? Q: What is the smallest substrate size I can use? A: The standard In-Situ 4000 Process Monitor optics will measure a circular area of the substrate with diameter D/25 where D is the substrate to pyrometer distance. For example, if your substrate to pyrometer distance is 38 inches, then the area measured is a circle of 1.5 inch diameter. SVT Associates also offers an alternate version of the In-Situ 4000 Process Monitor which measures a smaller area corresponding to a diameter of D/90, with the consequence of an upward shift in the temperature measurement range to 500-1200°C. It is important that the substrate surface completely fill the measured area so that the measured radiation corresponds solely to the substrate and not filament heaters, or wafer mounting surfaces. Q: What substrates may I use with the In-Situ 4000 Process Monitor? A: The In-Situ 4000 Process Monitor performs single channel pyrometry at 950 nm wavelength, so any substrate which is opaque at 950 nm will work. We have tested the system with GaAs, InP and silicon substrates. Silicon is semitransparent at temperatures below 550°C so some heater radiation may penetrate the substrate and provide a slightly higher than accurate reading. Transparent substrates such as sapphire may be used if an opaque coating is applied to the back side of the substrate, in which case the temperature measurement is being made on the backside surface of the wafer. See the related answer to the question of transparent substrates in this FAQ. Q: Can I use the In-Situ 4000 Process Monitor on transparent substrates? The back surface of the substrate must be coated with an opaque material. In this case it is the backside surface coating which is being measured for radiation rather than the front surface. The back surface of the substrate must be left rough or unpolished (i.e. single sided polish only). This requirement ensures only the front surface of the substrate contributes to a reflectance measurement. In theory, a polished backside might work, but the reflectance of a metal coated backside is often much higher than the front surface and makes a proper front surface reflectance impractical. In our application laboratory, we have successfully used the In-Situ 4000 Process Monitor to measure the temperature and growth rate of GaN films on transparent sapphire substrates. We used a thin film of a high temperature refractory metal on the unpolished back side to form an opaque surface for pyrometry. It is important to note however that use of the backside coating technique deviates from the factory temperature calibration and that a substrate temperature re-calibration must be performed by the customer. Fortunately this is easily performed with the In-Situ 4000 Process Monitor software provided some sort of in-situ melting point experiment is used. Also, the rough backside of the substrate can serve as a scattering surface for stray light in the chamber so that radiation from an effusion cell or an ion gauge filament may enter the pyrometer and cause an error in the reading. This is most significant at lower substrate temperatures where the radiated signal is weak. Q: What is the index of refraction of my film? These values are obtained from the Palik database (Handbook of Optical Constants of Solids, Edward D. Palik, Academic Press, First edition 1985, 2nd Edition 1991) and the Landolt-Bornstein tables (Semiconductors: Group IV Elements and III-V compounds, O. Madelung ed., Springer-Verlag, 1991). The data for GaAs is based on ellipsometry measurements by Aspnes et. al. (Phys. Rev. B 27, p. 985 (1983). Q: What is the reflectance of my substrate? A: The In-Situ 4000 Process Monitor reflectometer needs to be calibrated against a substrate of known reflectance. Listed below are the reflectances of an assortment of substrate materials (at normal incidence and at room temperature) from published values. Q: How should I calibrate the reflectometer to my chamber? A: Here is a step-by-step reflectance calibration procedure which should work for most users. Adjust the position and tilt of the optical head and the tilt of the wafer to achieve an image of the LEDs in the video monitor. Rotate the substrate to change the wafer tilt, or tilt the instrument slightly such that the LEDs are not visible in the video monitor. This case represents zero reflectance. Calibrate the reflectometer instrument by right-clicking in the Reflectance window and select "calibrate low" from the menu. Enter 0 for both the 470 and 950 nm reflectance values in the "Low" row. Click the "OK" button to dismiss the dialog box. Restore the LED reflection again by returning the tilt back to its previous value. If you use substrate rotation, ensure the substrate is rotating and the "wobble filter" is on when performing this step. With the LED reflections centered in the video image, right-click in the Reflectance window and select "calibrate high" from the pop-up menu. Enter the reflectance values for your substrate in the "High" row. Click "OK" to dismiss the dialog box. At this point, the reflectometer is calibrated to your wafer and instrument position. Do not change the mechanical position after this point to maintain the calibration you have just performed. Also, if your substrate holder has a large amount of tilt as it rotates, you may need to perform this calibration for each new substrate. Q: Should I use one-color or two-color pyrometry? A: The In-Situ 4000 Process Monitor is designed to operate using the one-color, or single channel, pyrometry. The radiated intensity at 950 nm is converted to temperature and is accurate even when depositing thin films. Some users may have some difficulty measuring temperature accurately if the viewport window itself becomes coated with materials during deposition. When this happens, the coating generally attenuates the radiation and the observed temperature drops. To address the problem of viewport window coating we have implemented a technique to re-calibrate the pyrometer using measurements at two wavelengths (950 nm and 850 nm). For those cases where the viewport coating is "metallic" as is the case of arsenic in GaAs epitaxy, the attenuation of light at 950 nm is largely the same as that at 850 nm and so the ratio of the two intensities is unaffected. We have provided a means of measuring the intensity ratio to easily update the single color temperature calibration in software so that drifts in temperature due to viewport coating can be easily accommodated. The two-color, or ratio, measurement in fact becomes invalid once thin films are deposited since the thin film interference affects the two wavelengths differently. Q: What is the difference between one-color and two-color pyrometry? A: One of the main features of the In-Situ 4000 Process Monitor is the ability to properly measure the temperature of wafers with growing dielectric films. Other pyrometers cannot do this. Single color simply measures the intensity of emitted radiation in a given wavelength band. That intensity is mathematically converted to temperature based on Planck's law. The law however requires 2 unknown parameters: the "geometry factor" and the surface emissivity at that wavelength. The "geometry factor" is a measure of how much light is collected by the optics, how big an area on the wafer is measured, and how sensitive the sensing electronics is in converting the radiation to a voltage. Typical pyrometer manufacturers will calibrate the "geometry factor" against a "black body" which is at a known temperature. Black bodies have an emissivity of 1.0. A cavity or oven will approach an ideal black body, so black bodies are often constructed as small ovens with a hole the pyrometer can peer into. The emissivity of any surface is the fraction of light emitted from that surface with respect to an ideal black surface. Real wafers will have an emissivity less than a black body (< 1.0), so the user must know what the sample emissivity is to translate radiation intensity to temperature. All commercial pyrometers have dials on them which allows the user to set the emissivity of any real surface, which must be known from some other means. The viewport window may be coated, or coat with time so that the geometry factor will be different than the factory calibration, or will change over time. The wafer (Si, GaAs, InP, etc) may be partially transparent due to the fact it has a band gap. It is improper to use a pyrometer where the wafer is transparent. In your case, if you had no metal on the backside of the sapphire wafer, the pyrometer would not work. It would "see" the heat from the filament and measure the filament temperature instead. Since the Mo on your wafer is opaque, the pyrometer is technically measuring the back side of the wafer. One then assumes that the temperature difference between the back side and front side is small. Even if the wafer is opaque, the emissivity may change with temperature as the wafer band gap shifts (not in your case). Depositing films on the wafer with a different index of refraction will alter the emissivity due to interference effects. The emissivity will vary with time as well as the films get thicker. This produces an apparent temperature change which is false. This effect can be quite strong when depositing very small gap materials like InSb or InAs on GaAs. In looking through a viewport, if the user mis-positions the lens and cuts off some of the light, or the viewport shutter obstructs some of the light to the pyrometer, then the factory calibration will be wrong. Pickup of stray light from incandescent heaters will cause a false reading, especially at lower wafer temperatures. Given these problems with standard pyrometry for MBE. SVT Associates intended to try to fix them. The In-Situ 4000 has two special features which can fix all of the above problems. Problems 1, 4, and 5 can be compensated if one can MEASURE the emissivity rather than assume an emissivity. This is what the In-Situ 4000 Process Monitor does, it measures the emissivity in real time and uses that measurement to calculate the temperature properly. If one makes 2 assumptions: the wafer is opaque, and the front surface is optically smooth (i.e. no scattering of light) our reflectance measurement at 950 nm allows us to calculate the emissivity at 950 nm only. Most MBE systems use very smooth surface wafers so this is usually ok. Wafer opacity is assured by properly choosing the pyrometry wavelength, so for example 950 nm was chosen because Si, GaAs and InP are reasonably opaque at 950 nm at operating temperature. The calculation is e=1-R where e is the emissivity and R is the specular reflectance. So in our temperature conversion using Planck's law, we substitute 1-R for the emissivity. This is why you must align and calibrate the reflectometer part of the instrument to measure temperature. This is also why one of the reflectometer wavelengths is 950 nm, to match the 950 nm pyrometer channel. Problem 3 is again fixed by ensuring the wafer (or the backside metal) is opaque at the pyrometer wavelength. Problem 7 is fixed if the wafer is also opaque so that IR light from other sources will not be reflected into the pyrometer. NOTE: This is not the case in your system as your wafer is transparent and the rough back side metal may scatter interference IR light into the pyrometer!! Problem 2 is dealt with by performing a calibration which is insensitive to window coating effects. The two-color technique provides this (see below). Thus, the In-Situ 4000 Process Monitor has the capability to compensate for these listed problems encountered in MBE systems making a single color pyrometry measurement useful. There are other more conventional pyrometers which employ two wavelengths to measure temperature rather than one. If you use a pyrometer which measures emitted intensity at two different wavelengths and make the assumption that the emissivity is THE SAME AT BOTH WAVELENGTHS then you may perform a slightly different calculation than that performed in single color pyrometry. Here, you compute the ratio of the two intensities. If the emissivity of the wafer is the same at both wavelengths then the ratio of the intensities is INDEPENDENT of absolute emissivity. That is an ideal black surface with emissivity of 1.0 will produce the same RATIO as a surface with emissivity of 0.2. This frees the user from needing to know precisely what the emissivity is. The resulting ratio is used then to compute temperature. This technique may be useful when the vacuum viewport window becomes coated over time. The window transmission will drop as it becomes coated and the single color measurement will then read lower than it should. If one assumes that the coating has the SAME transmission at BOTH measurement wavelengths (good assumption for many metallic coatings), then the ratio technique is still accurate. Thus the two-color system is designed to compensate for problems #2 and #6 above. However, the two color system in the In-Situ 4000 breaks down when films are deposited on the wafer due to problem #5 above. Since there is no reflectance measurement at both wavelengths, you cannot use the two color technique once film deposition has begun. Only the single color system is valid after film deposition has started. In our experience, we have found that the ratio measurement is very dependent on the substrate material. We therefore have provided the software with the ability to alter the ratio calculation to suit different substrates. This is the function of the "Temperature LUT" or "look up table". We have provided a LUT which converts measured ratios to temperature for a silicon substrate. 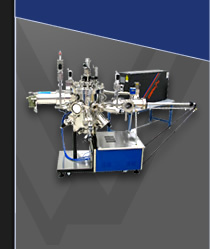 We measure this for each instrument on a special, calibrated, silicon wafer. Use the two-color system which solves problem 2 and 6 to calibrate the geometry and window coating effects of the single color system BEFORE coating has begun. The two-color measurement is only needed for an instant to provide a reference temperature for the single color system to follow from that point in time. After calibration of the single-color system, the ratio system is not needed anymore. After calibration of the single-color system, use the reflectometer to follow the emissivity changes in the film and compute temperature based solely on the single color system. As films are deposited, the single color system will still be correct. This is the design philosophy of the In-Situ 4000 Process Monitor system. The software is intended to be flexible enough for users to use the information however they see fit. Q: Will the In-Situ 4000 work with a heated viewport? Often the heated elements in a heated viewport are smaller than the 1.4" diameter viewport clearance needed to receive the radiated light from the substrate. Thus, there may be some light loss in passing through the viewport and the temperature calibration will be affected. The user may easily re-calibrate the instrument if the substrate temperature is known through some other independent means such as a melting point measurement. Some heated viewports run so hot that they emit radiation themselves. This radiation may enter the In-Situ 4000 Process Monitor optical head and affect the proper reading of the temperature. Q: How accurate is the deposition rate measurement? A: The In-Situ 4000 Process Monitor performs deposition rate measurements by fitting the oscillating reflectance as a function of time to a mathematical model. Q: Can I use the In-Situ 4000 Process Monitor during substrate rotation? A: Yes. Most substrate holders which rotate during deposition have some mechanical errors which cause the reflection angle to vary as the substrate rotates. This so-called "wobble tilt"causes a periodic change in reflection angle resulting in an error in the reflectance measurement and produces a variation in reflectance synchronized to the substrate rotation motion. The In-Situ 4000 Process Monitor system contains a special software sample and hold filter which accommodates even large amounts of wobble tilt. The reflectance is sampled once per rotation so that the measurement is correct, even when the wobble tilt is very large. Q: Will the In-Situ 4000 Process Monitor automatically control the substrate temperature? A: The answer is yes. It can be integrated into your temperature control system through a software interface. The pyrometer is not a "stand-alone" unit and must be run under the control of a Windows 9x/2000/XP computer system running the provided RoboMBE software program. The RoboMBE program will calculate the substrate temperature based on the substrate radiant intensity and the measured reflectance. The computed temperature is displayed on the computer screen, saved to a log file, and optionally available to another computer through the "Remote Control Interface". Please refer to our In-Situ 4000 Process Product Data sheet for additional information. Contact SVTA for more information.